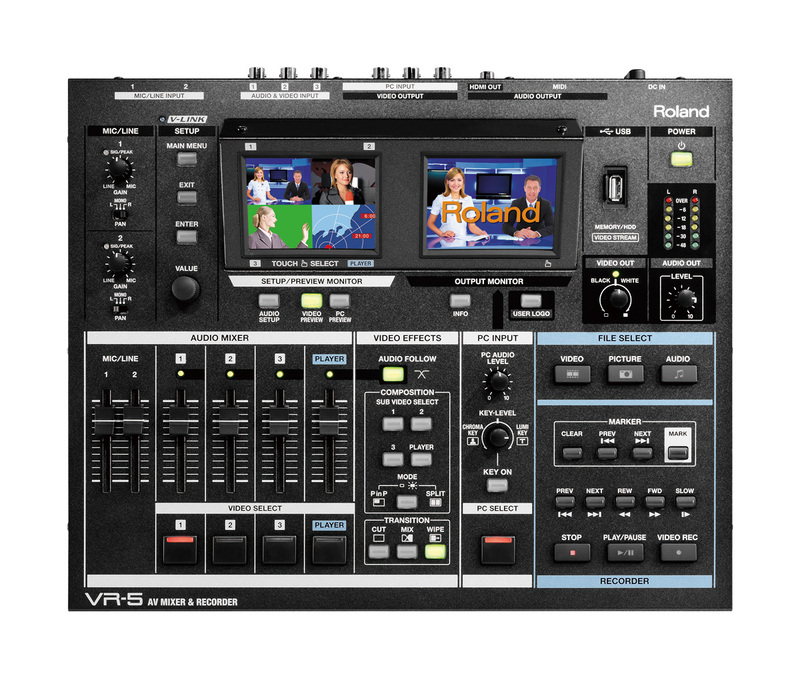 The Roland(or Edirol) VR-3 and VR-5 AV mixers are great "all-in-one" solutions for producing your multi-camera live event. The mixer connects with any Mac or Windows computer via USB cable so you can use the master output as your audio/video source in Ustream Producer or Adobe FMLE and stream live to your Ustream channel. The VR-3 and VR-5 are both Standard Definition models, with a maximum supported resolution of 480i. However, with the proper setup you are still able to use HD cameras and stream 16:9 widescreen video. If possible, we always recommend shooting and streaming widescreen, 16:9 aspect ratio. More important, however is that the video does not appear squished or stretched after being encoded for streaming. Many HD cameras give you the option of shooting and/or outputting SD video, so the widescreen 16:9 video is "squeezed" into the 480i NTSC frame and output over analog video cables to the VR-5. * The video will appear squeezed on the VR-5 monitors, but that's ok, we'll be expanding it back to the proper size within the encoding software. Now that we have our widescreen video squeezed into the VR-5, we need to connect the USB port to our computer for the encoding and delivery to Ustream. Here are a couple methods for expanding the video back to it's natural widescreen format using two of the most popular software encoders: Ustream Producer Pro and Adobe Flash Media Live Encoder. In the Broadcast menu, set the Canvas Size to 480p. 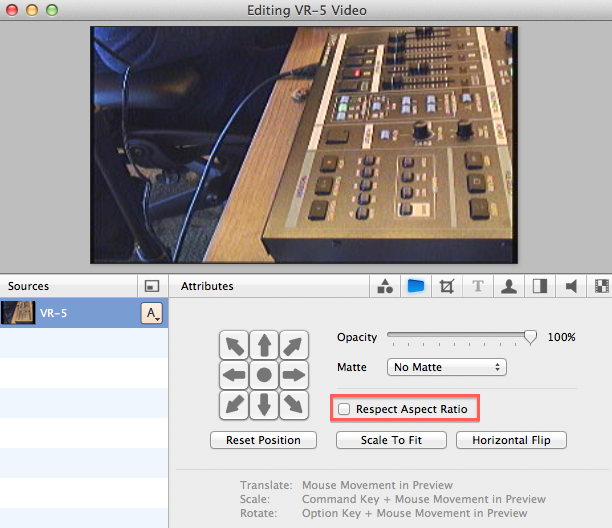 In the second tab of the shot editor, uncheck the 'Respect Aspect Ratio' checkbox. This will expand the video back out to fill the full 16:9 frame. 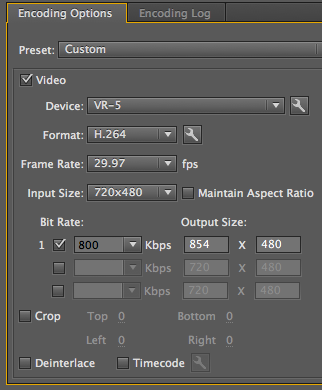 Now in the broadcast settings, choose an encoding preset with a resolution of 640x360 or 854x480. Since the actual source video is only 480 lines, encoding high resolutions(like 1280x720 for instance) will not result in better quality and will be a waste of bandwidth and computing resources. Choose the VR-5 for your Video and Audio device, set the video Input Size to 720x480 and uncheck the Maintain Aspect Ratio checkbox. Set the output size to 854x480. *some HD cameras give the option of "Squeeze" or "Letterbox"(or similar labels) when down-converting to SD. "Squeeze" as you would expect, squishes the widescreen video into a narrower frame. "Letterbox" will center the widescreen video within the SD frame with black bars on the top and bottom. When using the VR-5, you'll always want to use "Squeeze" mode.